This is the book I bought to learn about how to grow microgreens, available on Amazon. Why the Sudden Interest in Microgreens? 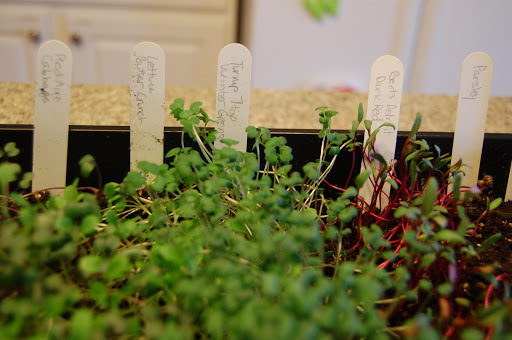 A few years ago, when my boys were ages 2 and 7, I discovered microgreens. It had been a long winter, and I was aching to be outside. January and February are the months when my family gets a new seed catalog in the mail at least once a week! This may be from my last 17 years of mail ordering seeds and bulbs! The first time I heard the term, microgreens, was at a “Grow Your Small Market Farm” class my husband Tim and I took at Iowa State University during our days as cut flower growers. I had no interest in microgreens at the time, because I was deeply invested in growing cut flowers. I was always curious about what they were and how to grow them, but never made the time to learn more, until that long, cold winter a few years ago. 1. Microgreens taste great: They give your salads a kick in the pants by adding a little bit of spice but not too much. Radish microgreens, for example, have a kick, but are not nearly as strong as eating an actual radish. I would say they have about 1/3 or less of the spice of the actual full grown radish. The same principle holds true with other plants. 2. Microgreens are super easy to grow: Most of my favorite microgreen varieties will sprout from seed in 7 days or less. 3. 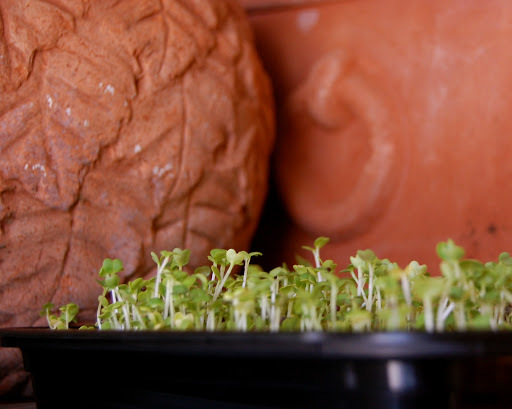 Fun and Easy Project to do with the kids: Since the seeds germinate so quickly, and large quantities of seed are broadcasted over the seed tray, kids will enjoy it. 4. Microgreens are packed with nutrients. 5. Microgreens take very little space to grow. 6. Microgreens take very little supplies to grow. 7. Microgreens can be grown year round in your home. The picture below is what full grown arugula looks like. Arugula is a fun one for beginners, because the seeds sprout really quickly and easily. Arugula at this stage is very strong tasting, and sometimes, a little bit too intense in flavor, but if you just eat the little microgreen seedlings, the flavor is subtle, sophisticated, and delicious as a garnish, salad accent, or atop a beautiful panini, burger, or cold cut sandwich! Arugula seed is really inexpensive, quick to germinate, and very rewarding in terms of flavor when harvested as a microgreen! Click the photo on the right, if you want to get some of your own seed to try. To order Arugula seed on Amazon, click the pic above! Below is a packet of Dwarf Blue Curled Scotch Kale. It sprouts very quickly, so it’s really rewarding to plant these with kids! It’s packed with nutrients, because, well, it’s Kale! It can be harvested as a microgreen, or allowed to get a little bigger for baby salad greens. But let me tell you, even though it is Kale, it tastes so much milder when you harvest it when it’s only 2 or 3 inches tall with cute little baby leaves! I have waited until the leaves are about 1inch by 1inch, and then pinch them at the base of the stem without removing the center of the tiny plant, and gotten several cuttings throughout the summer this way. I suppose letting it get this big, probably makes it less of a microgreen and more of a baby salad green, but regardless, it’s a great addition to salads, and it also holds up in soups…think potato soup with Italian sausage. Radish seeds are super easy to sprout, and they will pop up in a week or less! And these little cuties are purple! Don’t let their cuteness fool you though; they pack a spicy punch in that tiny little seedling, making them perfect for spicing up your burgers and sandwiches! This variety is called Rambo. Below are Bull’s Blood Beets! Quite a bit different from what we all normally think of when we think of beets. They are so fresh and colorful, and would be so beautiful and nutritious as a garnish to just about anything! Well, maybe not with cereal. These guys are so colorful, especially in the dead of winter! Click the pic to shop for Bull’s Blood Beet Seeds. Japanese Mizuna is another easy to sprout seed that is packed with flavorful punch! Plant these little guys if you are a fan of the spicy mustard flavor of wasabi. 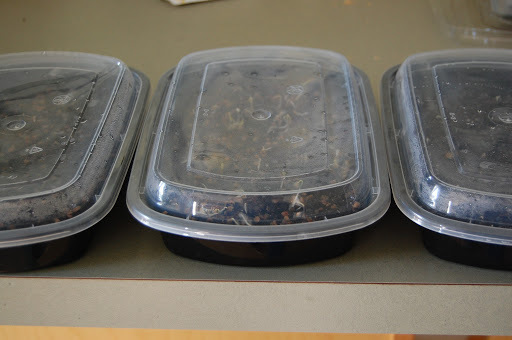 Re-used Take out food containers made the perfect mini greenhouse for growing microgreens! Just make sure to wash with soap before adding your germination potting mix. The tray to the above is a tray of peas sprouting just 3 days after we planted them. The tray to the right is all Arugula about a week after we seeded them. The trays are re-used take out containers from a local restaurant. No drainage is required. I would recommend using a shallow container no more than 2 inches deep to prevent excess moisture and seed rot. We used regular Miracle Grow Seed Starting Soil. Let’s Play in the Dirt! We poured some soil in a 2 gallon bucket, brought it to the kitchen sink, and used the sprayer to wet it down. Potting mix takes a while to absorb water, so you get to squirt water on it a lot…bonus for my little guy. Then you get to stir it up with a big spoon until it is just right. Not sopping wet with water standing in it, but wet enough that if you picked up a handful, and squeezed it, you could form a ball. 1. Once the soil was moist, we put it in our cleaned take out trays, pat it down a little bit, and then scratched the surface so it was rough and not totally smooth. 2.Then we took our seeds and scattered them just as if you would be sprinkling salt on a steak. About 1 seed every half centimeter or so. Not precise, just scatter and have fun! 3.After we spread the seeds, we scratched the soil a little bit again gave it a love pat, and covered up the tray with the clear lid. A perfect moist environment to get them going. 4. Once you get them planted, you can put the tray on top of the fridge, so they get some bottom heat, which speeds up sprouting(germination). NOTE: If you keep the lid on your trays, you should not need to water them until after they have sprouted. I kept a mister on hand, and misted the seeds right after we gave them their love pat, and then left them alone. How Do I Care for Microgreens Once They Sprout? We checked our seedling trays daily for signs of life, and after about 3 days, the peas began to sprout. KEEP THEM COOL AND BRIGHT!Once they all sprouted, I removed them from above the fridge and place them in a cool, yet sunny window, and away from heat vents. An ideal temperature average would be between 60-70 degrees F. once they sprout. Microgreens can also be grown in a cool place like your basement with fluorescent lights overhead. In order to not disturb the soil too much, I usually would turn the kitchen faucet on the lowest pressure possible, and directed the water along the side of the container to let it seep down to the bottom, so as to water the roots from the bottom up. I might have used about 1 cup or less of water per tray, let it soak up, and then poured the excess off by tipping the tray gently to one side. Not a lot of water is needed. Once the lid is removed, it is important to maintain even soil moisture for your microgreens…but not have the sprouts sitting in water. If you think you put too much water in the tray, just gently tip it at an angle to allow the excess water to drain over the edge of the tray. After about a week and a half, we had a crop. I just left them in the container, with the lid off, and snipped as needed to put in my salads or on sandwiches and burgers. The kids actually loved eating the pea shoots. Peas shoots are sweet, tender and delicious. They also make a beautiful garnish if you like things fancy. That’s it on microgreens for now. I hope you learned something and that you’ll consider giving this fun little project a try! Stay warm! If you look closely, you will notice that each type of seed sprouted at different times. This is one reason why I would rather purchase separate packets of seed types instead of a mix several kinds of plants. When the seedlings are about an inch or so tall, with about 2 little leaves on them, you can begin cutting what you want to eat! I like to label each type of plant and also mark the date that I planted the seeds, so I can keep track of when to expect them to start sprouting, and of course, remember what flavor to expect before I sample them! Popsicle sticks, or even plastic spoons could work. Pencil is the best utensil to write with. < In a Funk? Make a Salad!